"Basic Introduction To Tinder But Short On Content And Examples"
Gives you an overview of the right mindset to have to be successful on Tinder. Solid advice on photo selection and what you should be aiming for. Provides a few example message exchanges. Fairly short ebook. Doesn't go into much depth on the messages or provide enough examples. Doesn't include photos to illustrate the points. Unclear what level of success the author himself has had. This is a really short guide that serves as an introduction to Tinder, and is quite basic in what it covers. It goes into quite some detail on photo selection, but the rest of the book is only covered superficially. It would have been helpful to have more examples of good messages and what to do after getting the phone number. If you've never used Tinder before you might find some of the information in here helpful for getting started, but a better quality product to check out is Conquer Tinder. 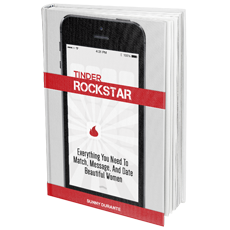 Tinder Rockstar is a 50 page eBook by Sunny Durante that aims to get you set up and getting success on the hottest dating app going around. It takes you through the process of setting up your profile to getting a woman's number and arranging a date with her. It starts off by going over the mentality of a high-value guy in relation to Tinder. It's just a list of five bullet points, and is line with the type of advice that is standard now in the dating industry. If you've never come across any of this information before then you'll want to pay attention to it and remember it. When it comes to Tinder, the photos you use are either going to make you or break you. Unlike online dating, there isn't really a section for a written profile, so the only thing someone can judge you off is your photos. Sunny mentions here that he worked in the film and television world for a few years and so learned a lot about how visuals are used to tell a story. That's what he focuses on here when choosing the right photos and this section is the strongest of the book. However, it would have been even stronger if there were actual photos included to demonstrate his points. There is also a tip of how you can apply a wording overlay to your main photo to catch a girl's attention and stand out. There is anecdotal evidence of how it led to a boost in responses, but also says why you might want to avoid the specific example given. The basic concept could be worth playing around with though and seeing what kind of results it gets you. There is a suggestion by Sunny of one you might want to try, an example that he says is funny and will lead to more women messaging you first. Perhaps this is the case, but I didn't get it at all. It struck me more as odd than funny and isn't something I'd use myself. On Tinder you can create a short tag line that can be seen if somebody decides they want to see more of you. Usually this is because they want to see your other photos besides your main profile pic, but if you choose to write anything this is where they'll see it. Unlike online dating sites, you don't have to include anything, and many people elect not to. But it does provide you with a chance to display some personality and show your sense of humor, so it's something you might want to test and check the results. Sunny shows four examples of bad tag lines and details why they are bad. He then lists three examples of good ones, one of which is the same as his suggestion for the word overlay on your picture. Not sure why it's supposedly funny, but if you're going for humor I would lean towards the third example he provides. Would have been good to see some more examples here, and ultimately you'll probably want to construct your own if you use one at all. Just because a girl selects you on Tinder doesn't mean you're over the finish line yet. There's still going to be a number of other guys messaging her and you have to find a way to stand out enough so that she wants to meet you in real life. The advice in Tinder Rockstar is more in line with what you see advised for traditional online dating sites. You're told how long you should roughly wait to send a message and how long to wait to return a message when she replies. For sending an initial message, there are three examples shown, all of which are a few lines long and meant to be funny and playful. Although your main goal, Sunny states, is to use your own personality and develop your own messages. The advice here about the types of messages to send and waiting time for messages is in stark contrast to the advice in Conquer Tinder, which favors shorter messages and less waiting time. There is no one right way to do anything, and in reality different girls will respond differently to various approaches based on their own preferences. But from a personal viewpoint, I tend to favor the approach lined out in Conquer Tinder, if for nothing else than it is much simpler. When you get to the point where you are getting lots of matches, I would rather send an opening message that is only a couple of words versus one that is more than twenty words. To see what gets you the best results though, you'll need to experiment. In terms of what to say after the initial message, there really isn't much guidance, apparently because this part of the exchange is about you and how you choose to communicate. But for a book aimed at beginners there really should have been a lot more detail in this section. You do get some idea of what to do in the real life examples shown, so if you can break that down and deconstruct it you can learn the types of messages to be sending here. There is some short, but decent, advice on what to do if she ignores your message or if the conversation needs reviving at some point. And in terms of getting the phone number and progressing to texting, it's kept really simple and basic. If you've done everything right up to this point, getting a number should be no big deal. In terms of what to do after getting the number, there is some advice about whether to keep texting or if you should call based on how old you are. But the justification given for it is about how girls under a certain age don't feel comfortable answering a call, in which case case it would seem to make more sense to change your approach based on the age of the girl, not your own age. In any event, I would personally just stick to texting and not even worry about it. There are three example conversations included, so you can see all of the way through from the initial message right through to exchanging phone numbers. It's a good illustration of keeping things light and playful and avoiding boring conersations that other guys are likely to have. This section takes up five pages of the book, and there isn't any commentary provided on any of the messages. In contrast, Conquer Tinder has a similar section that takes up 20 pages and includes detailed analysis of the messages. It's also more appealing visually as the messages are included in the colored text boxes you get on Tinder, whereas here in Tinder Rockstar they are just written out in plain format. It'll help show you that getting numbers isn't that big of a deal, and if you can show women that you're a fun and confident man there's no reason they won't give you their number. This product is 50 pages, but with wide margins and some pages that are half empty, it's actually less than that. When you consider that there are no bonuses included here, this product is kind of expensive in terms of how much content you're getting for your money. There are a lot of areas where more detail could have been provided and more examples given. It also would have been good to hear about personal results that Sunny has gotten with Tinder, as this is not clear at all. He writes from a more general point of view, rather than being specific about what he has done, so it's hard to say how much experience he's had with it himself. A couple of bonus chapters are included as part of the book, on how to make your dates awesome and how to spot red-flag women on Tinder. Decent but basic advice, and if you've read other advice about how to plan dates it will be nothing new. If you've never come across it before, then it'll be good for you to implement.